Philippi-Hagenbuch's new version of its Autogate Tailgate specially designed for Komatsu rigid frame trucks. 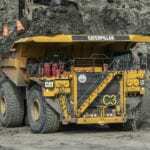 United States company Philippi-Hagenbuch (PHIL) has developed a new version of its Autogate Tailgate system for use with Komatsu rigid frame haul trucks. 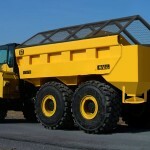 The company, which has been producing its Autogate line since 1969, unveiled the design at the aggregates-focused 2019 AGG1 Academy and Expo held in Indiana by the National Stone, Sand & Gravel Association (NSSGA). 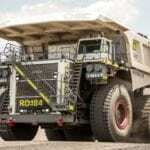 The latest design uses an outrigger that bolts to the truck’s undercarriage, which eschews welding and allows Komatsu operators to retain their original truck frame warranty. The latest design of the Autogate Tailgate is available for use with Komatsu HD405-8, HD465-8 and HD605-8 haul trucks, with retrofit kits to follow for older models from late spring 2019, according to PHIL. 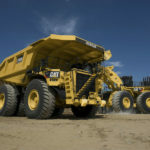 “The new design reflects PHIL’s commitment to keep pace with client feedback and constantly innovate new ideas to maximise efficiency and minimise maintenance on the ever-changing models of off-highway haul trucks available,” the company stated. Sideboards are also available ranging from six inches (15.2 centimetres) to 40 inches (101.6 centimetres) in height, providing a unified body height while increasing volumetric capacity. Body seals, fluidic seals and cushion pads are optionally available to further customise the tailgate.